You may not think of tuna salad as a typically Mexican dish but it is very popular. You must serve it with crackers, usually saltines (galletas saladas) and a squirt of lime. If you forget the crackers, you will get the indignant question, “b..b..but…, where are the crackers?” You must then present the crackers or no one will eat it. The association between tuna salad and crackers is an unbreakable bond. Think baseball and apple pie or peanut butter and jelly. This is our photographer’s preferred way to make tuna salad. You can add a bit of minced serrano chile or hot sauce if you want it piquante. You might also like our spicy tuna salad with avocado. Recipe for Mexican style tuna salad with cilantro and lime. This is our photographer's recipe. 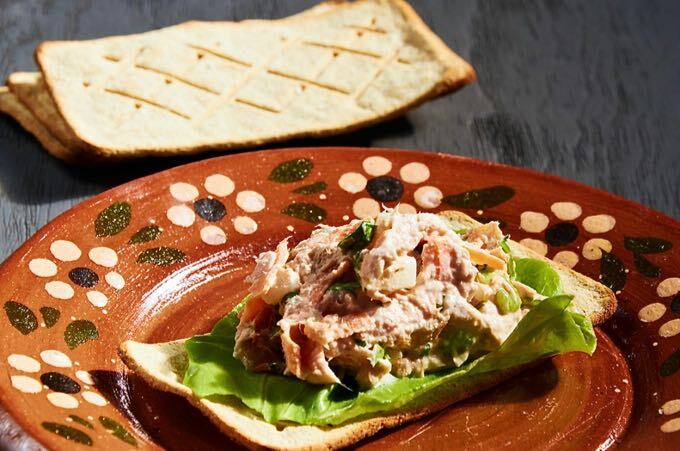 Tuna salad served with saltine crackers is very popular quick meal in Mexico. Remove the stems from the cilantro and finely chop the leaves. Place the tuna and the chopped ingredients in a mixing bowl. Add the mayonnaise and stir well. Wash and separate the lettuce leaves. Pat dry with a towel. 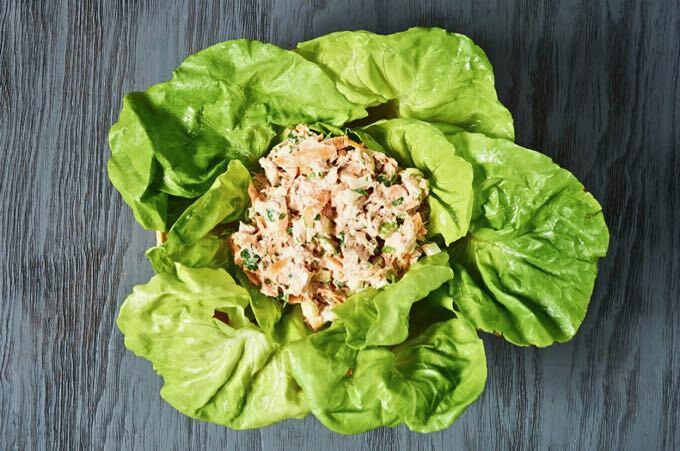 On each cracker, place a lettuce leaf and then top with a spoonful of tuna salad. Serve with a sliced lime on the side. You can also use it as a filling for tuna salad sandwiches. Add a bit of minced serrano chile or hot sauce if you want it piquante (hot). Love it! Thats a great twist on a classic.